For National Pi Day March 14th, share these with your class and a lesson on Pi. Better yet, plan a Pi day party. 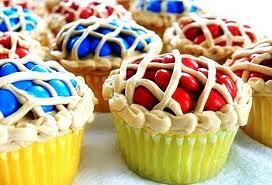 Use box cake mix to make the cupcakes, tint your homemade butter cream icing to the shade of pie crust, put enough icing on the cakes to make m&ms stick, then pipe the lattice work, and finish by piping the crust around the edges. 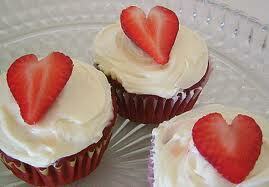 Use this simply delicious strawberry cake recipe by Paula Deen to create gorgeous cupcakes with fresh berries on top.